Powers/Abilities: Able to fly, superhuman endurance. Superhuman strength (the strength of "a thousand men"), X-ray vision and "the wisdom of ages". When revived in the Silver Age she only retained the power of flight. History: (Marvel Mystery Comics #49-85, Miss America #1-5, g.a.) Madeline Joyce was raised by her uncle, a wealthy businessman who was funding experiments in electricity. Being a curious person, Madeline decided one day to have a look around the lab, which was located inside a converted lighthouse along the coast. Her timing was unfortunate, for that same night the area was victim to a freak storm, and the lighthouse was struck by lightning while Madeline was inside. Her body was subjected to so much voltage that she should have died hundreds of times over. Instead, she was sent into a coma for a week, and when she awoke she discovered she had gained miraculous powers. 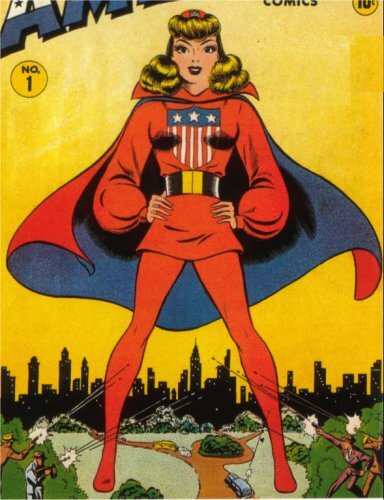 Inspired perhaps by tales of other superhumans, Madeline created a patriotic costume and ventured forth to fight crime as Miss America. (Marvel Premiere #29, Invaders I #6, Marvel Premiere #30, Invaders I #7) Miss America joined several fellow heroes in forming the Liberty Legion, first to free the brainwashed hero group the Invaders, and then, having decided to stay together, to defend the American homefront against Fifth Columnists. 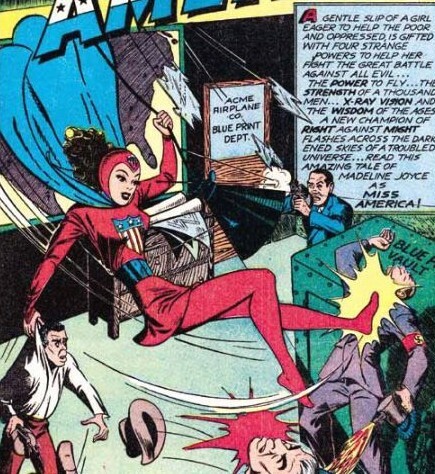 (Invaders I #35-38) Miss America joined the Invaders in battling the armoured German superhuman Iron Cross. (Invaders II #1-4) Alongside the Invaders again, Miss America fought the Battle-Axis, American superheroes who had switched to the Nazi cause. (Captain America Annual #6) During June 1946 the Invaders travelled to Japan to destroy a solar-powered prototype tank. (What If? I #4) Miss America was present when the android Adam II attempted to assassinate a young and up-coming politician, a fight in which one Captain America lost his life (the Spirit of '76), and another took up the mantle (the Patriot). (All-Select #11, Blonde Phantom #12-14, Sun Girl #1, ga) No synopses available. (Citizen V and the V-Battalion #2, fb) Miss America attended the funeral of Union Jack (Brian Falsworth), who had died in a car crash. (Avengers I #185, 185, fb) Miss America soon became pregnant again. The couple were travelling in Europe at this time, and with Madeline close to term, they sought aid from Herbert Wyndham (a.k.a. the High Evolutionary), a geneticist who lived atop Wundagore Mountain in Transia. The child was apparently still born, and Miss America died giving birth. She was buried on the side of the mountain. Comments: Created by Otto Binder and Nicholas Charles.